This sketch will readout RF power and SWR from any SWR bridge (for example 'monimatch' type). As this 'monimatch' type of bridge is frequency dependant, the meter must be calibrated for every band. Because my primary interest was for VHF/UHF/SHF, I have foreseen positions for 6m, 4m, 2m, 70 cm, 23cm and 13cm bands - but you can use the ARDUINO readout on HF as well. If you intend to build a HF or VHF bridge yourself, there are several designs available on the web : I recommend to take a look at the information here, here , here and there ! 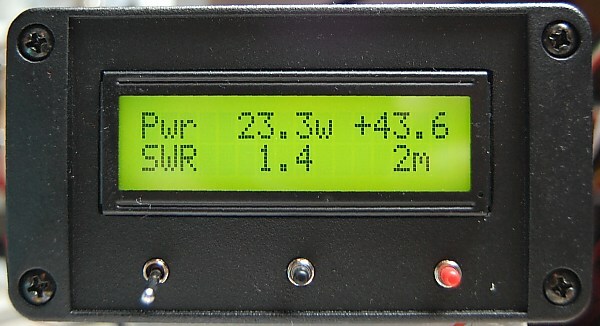 display instantaneous power forward in Watt, display SWR, and emit 'beeps' corresponding to SWR value: low tone beeps at slow rate for low SWR, high tones at fast rate for high SWR. Very handy to tune an antenna when you can't have your eyes on the meter while fiddling on the antenna! When the band is selected/changed, the display indicated the 'full scale' of power readout. With my type of bridge (some breakout part of mobile radio base station I presume, but working well till 2.4 GHz - I purchased it on a local flea market...) the power ranges from 1kw (6m band) to 400mW (on 13cm). Other possibility is to build a directional coupler, many designs can be found on the net. With my coupler, in the PEP power measurement mode, it is for example perfectly possible to measure the output of a WiFi access points ... Power range could be increased by adding some resistive voltage dividing network, as the maximum input on ARDUINO is +5v. But is is essential that same power gives same voltage, both in 'forward' as 'reflected' mode (when the coupler is turned around). The meter is indented to be battery powered, therefore there is a circuit to control the LCD backlight (drawing a lot of current) and monitor the battery voltage. Below is the sketch or download it here . It was compiled with IDE version 0022.- IMPORTANT : please use the same or you might get errors when compiling ! You still can download previous versions from ARDUINO website . Download the connection diagram (as pdf) here or a better schematic drawn by Vlado Z32AN here. How to calibrate the power indication ? 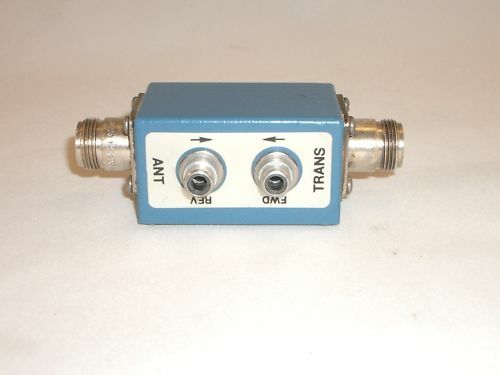 Using a directional coupler which is not frequency compensated, the forward voltage (indicating the power) will be frequency dependant. For a 'monimatch' type, the voltage will increase with frequency - or - otherwise said, the meter will become more sensitive at higher frequency (off course, as long as it is operated within it's design frequency range). The maximum voltage which can be measured by Arduino is +5v , this is limiting the range upwards - if necessary, a voltage divider must be foreseen (same on REFL side off course!) - according to your frequency, power & coupler. uncomment the calibration routine lines, this will show the VoltFWD value. Replace 2x the asterisks by a slash like below, and load the sketch in ARDUINO. // This routine prints on LCD the FWD voltage measured. apply (for each band of interest) a known 'reference power', terminating the coupler by a dummy load (SWR = 1:1). This should produce a readout of VoltFWD, somewhere in the range 0 - 5000 (or just above 5000, as the diode voltage drop is added) - this is expressed in milliVolt. Ideally, this readout should be in the range 2000 - 4000 ('mid-scale'), adjust the reference power accordingly. Let us assume that we measure on 145MHz 2500mV with 10w power, note this value. Enter this value in the sketch, for the respective bands. Test the readout with the 'reference power levels' - DONE ! it is be possible to measure the power not by using the 'FWD' voltage over the coupler, but directly by rectifying a sample of the RF, and measuring this voltage - which should be less frequency dependant than the coupler method. I leave it up to you to implement this in your sketch... using another ARDUINO analog input port. This can be feasible on HF, VHF ... but might be more complex on UHF and above - therefore this approach was not realized in this project. Depending on your coupler design, it can be required to 'load it' in order to have the output going to ground level when no RF-power is applied. ARDUINO analog inputs have a very high impedance, so any stray voltage picked up can cause random readouts or 'beep-beep' when no RF-power is applied, in this case, put a 220k or 470k resistor from FWD and REFL inputs to ground. Off course all wiring to coupler must be shielded and properly RF-decoupled ! If a 3-way toggle switch is present, it will be automatically detected and the variable 'PushButton' set accordingly. When using a push button, Pins 2 and 3 must be connected to +5v ! It can be necessary to apply different parameters / calibration factors per band. // voltage divider at A5  - select proper values so that voltage never exceeds 5v on A5 ! // Carry out calibration with sufficient power ! // Print a message to the LCD. if (BAND >= 7) BAND = 1;    // set 0 if HF is enabled ! // This routine prints on LCD the FWD voltage measured. if (SupplyVoltage <= 50) return;       // not running on batteries !